As I mentioned in a previous post, I would show you all a few dishes that ended up on our kitchen table for our Thanksgiving dinner. 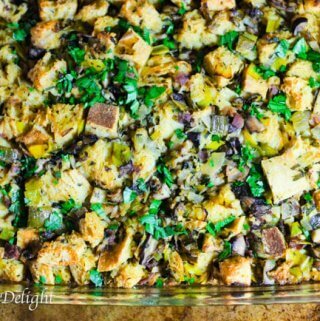 Even though Thanksgiving is now behind us, Christmas is still ahead of us and this dish could make a special appearance on your table. However, if not for Christmas, then I’d recommend you saving it for the next year…it’s soooo worth it! 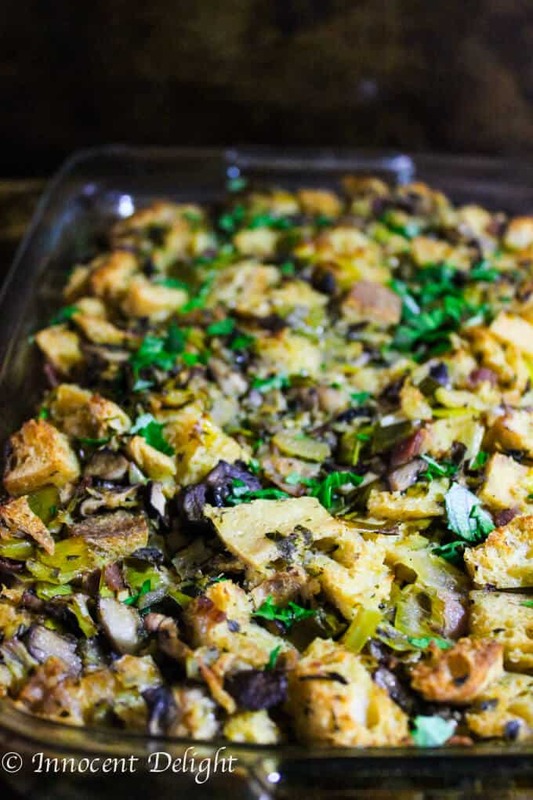 This Sourdough, Mushroom, Leeks and Bacon Stuffing is adapted from a Bobby Flay “dressing” that he serves at his Bar American restaurant on Thanksgiving menu. 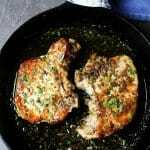 It was featured in last year’s Thanksgiving edition of the Food Network Magazine. 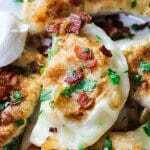 My spin on this Bobby dish is the addition of leaks, which I absolutely love and they worked beautifully in combination with mushrooms and bacon. 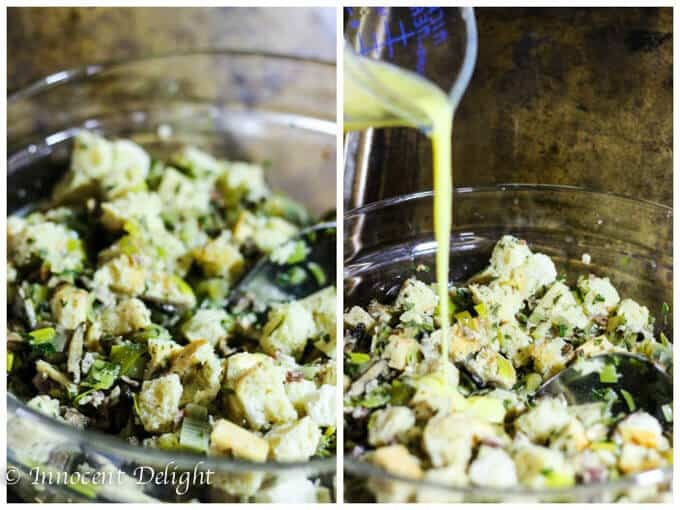 A year ago I made this dressing, following the recipe exactly as given and it was great. I knew this would become a Thanksgiving staple in my house. This year, like I said, I put a bit of a spin on it. I started cooking the broth the night before so my broth was room temp when I needed to use it the next day. I started with cooking bacon bites and after they were done, I took them out and cooked onions with garlic herbs and leeks, added broth and let it simmer for couple of minutes. The smell was mesmerizing. While it was only the night before Thanksgiving, the whole house smelled like Thanksgiving day. 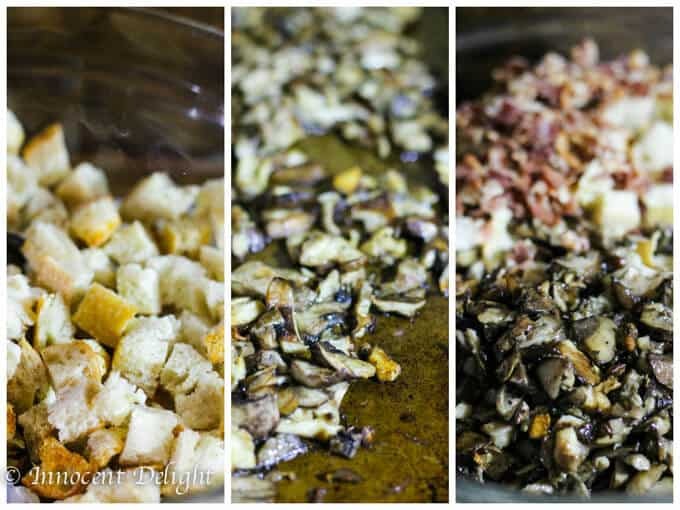 On the morning of, I toasted cubed sourdough bread, then I roasted 3 types of mushrooms in the oven. Once all of these components were done, I combined the ingredients in a big bowl: bread, mushrooms, bacon, added broth and bitten eggs. I mixed it very carefully and then placed in the baking dish and put it in oven. Estimate about an hour to cook this dish it in the oven. First you should cover it with foil for the first 20 minutes, then take the foil out and cook uncovered for about 30 minutes. Let it then cool down for about 10 minutes before serving. This will look like the pictures below. I took those photos while it was steaming hot. Needless to say, I wanted to dig in immediately and try it, but there was no way I could’ve done it. The wait was well worth it though. 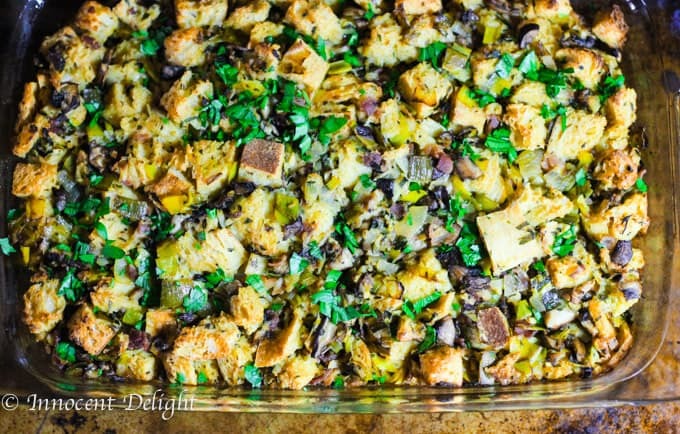 This Sourdough Mushrooms Leeks and Bacon Stuffing worked so wonderfully with my Maple Mustard Glazed Turkey. As mentioned above, this dish was an adaptation from Bobby Flay’s “Wild Mushroom-Bacon Sourdough Dressing”. On my way to work the morning before Thanksgiving I was listening to my favorite Elvis Duran morning show on Z100 and they had a stuffing cook-off with guest judge Bobby Flay. 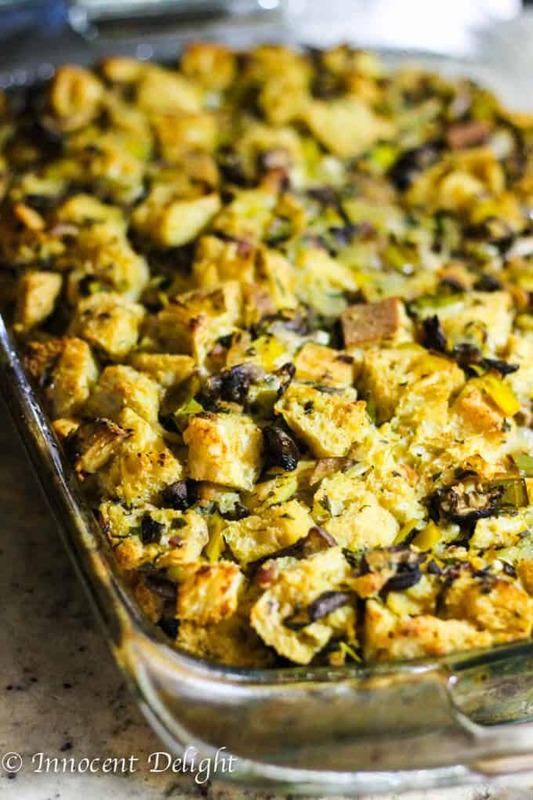 He said that he grew up calling this type of dish a “stuffing” but was corrected many times to finally agreed and called it a “dressing.” Evidentally, if it is stuffed in the turkey, then you ought to call it “stuffing;” but if it is served separately, then it’s called “dressing.” It may be a proper, but for me when I hear “dressing” I think Ranch or Vinaigrette. 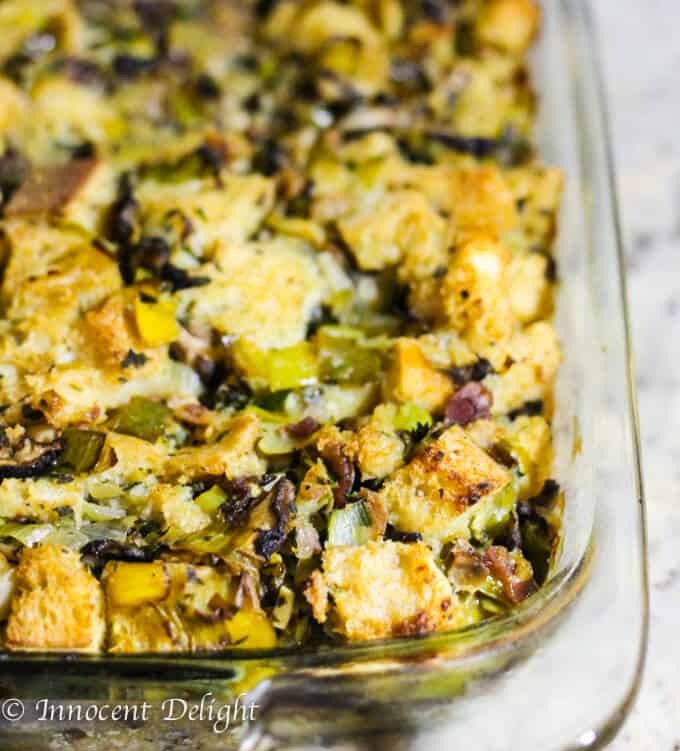 It’s hard to make this distinction in my mind so that’s why I call this dish Sourdough Mushrooms Leeks and Bacon Stuffing. So where do you fall on this, ‘stuffing vs. dressing’ debate? I’m curious which one prevails. Preheat the oven to 350 F. Spread the bread on a baking sheet and bake for about 15 minutes, string a few times. Once the bread cubes are golden brown, remove from the oven, let it cool down and transfer to a big mixing bowl. Remove from the oven and let cool down for about 10 minutes before serving. 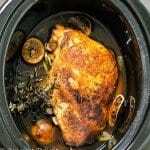 You can make it ahead of time and heat it up in the oven half an our before dinner.